Add foraging fun to your bird's environment with this Barrel Of Fun-Nature's Instinct green puzzle toy and treat holder in one. Teach your bird to unlock the chamber and reveal hidden delights. Simply hide treats inside the chamber, close, turn to lock, then hang and watch your bird's instinct take over. Fill with fruits, veggies, or your bird's favorite treats. Made from shatter-resistant, durable polymer to withstand tough chewers. Chain and quick link included. Zinc-free. 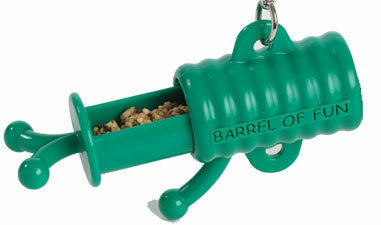 Barrel of Fun Bird Toy - Interactive puzzle toy encourages birds to forage for their treats. Durable bird toy withstands tough chewers and satisfies the daily need to search for food. Notify me when Barrel Of Fun-Nature's Instinct is in stock.